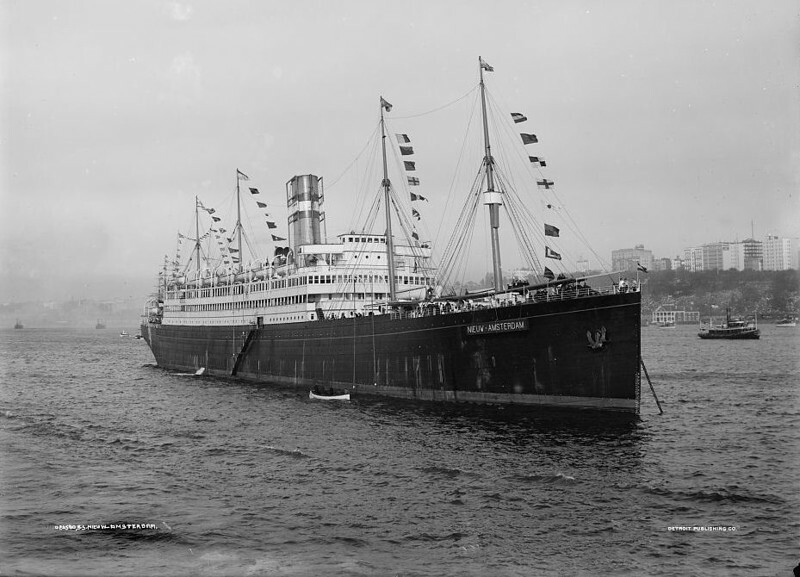 This is the ship in which Benjamin Hendrickson (then age 29) sailed home from Rotterdam to New York in August 1914 after a harrowing trip through the front lines of the Great War to the seaport from deep within Germany. Wiki: "SS Nieuw Amsterdam was a ship built in Belfast by Harland and Wolff. It was launched in 1905 and on April 7, 1906, made its first voyage to New York from Rotterdam. The Nieuw Amsterdam was fitted with sails, but they were never deployed; it was the first quadruple expansion powered ship of the Holland America Line. In 1914, the ship brought almost 1,700 United States citizens back to the states from Europe at the outbreak of World War I. It was not used again until 1917 when it took 2,300 Dutch seamen from the United States back to Holland."